They were introduced as the rock star astronaut and social media giant. 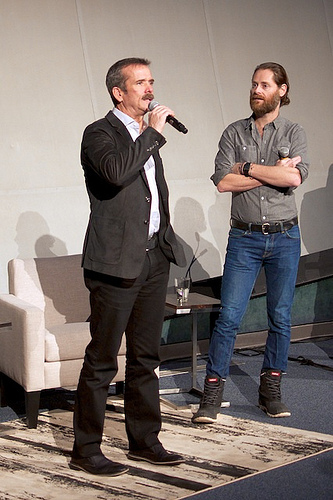 Colonel Chris Hadfield and Hootsuite CEO Ryan Holmes kicked off the inaugural Innovators Speaker Series event forScience World at the TELUS World of Science last week. Hadfield shouldn’t need much of an introduction, but it’s worth noting that he’s the pioneer of many “firsts” in Canadian space history. That includes: the first Canadian to use the Canadarm; the first Canadian to board a Russian spacecraft; the first Canadian to perform two spacewalks as a mission specialist on STS-100; and the first Canadian to command the International Space Station (ISS). He’s also currently promoting his book, An Astronaut’s Guide to Life on Earth. Meanwhile, most of Canada’s technology community is familiar with Holmes’ efforts as the CEO of HootSuite. Beyond changing social media management for over seven million users across six continents, he’s also an authority on the social business revolution. Holmes further serves the community as an angel investor and advisor, mentoring startups in Canada and around the world. While he wasn’t the first to tweet from space, he’s certainly prolific with his 140 character musings, so it seems only fitting for Hadfield and Holmes to have a conversation about science, space, the power of music and social media. The evenings host, Riaz Meghji, had them each reflect on a conversation that proved to be of early importance in life. Holmes spoke about a Grade 12 teacher relating the story about 15th century workers throwing their sabots (wooden shoes) into the wooden gears of textile looms to break the cogs, fearing the automated machines would render the human workers obsolete. It shouldn’t come as a surprise when Hadfield revealed that “two guys named Buzz & Neil” were his inspirations. Holmes asked if space tourism is realistic? As Hadfield pointed out “private citizens have paid up to now some $30 million to go, including the founder of Cirque du Soleil who bought a ride with Russians. He spent six weeks training in Russia to fly aboard Soyuz. As well, you’ll soon be able to spend $250,000 and fly Virgin Galactic to get the sense of weightlessness.” Hadfield likened the future of spaceflight being an everyman experience to that of the history of buying an airline ticket. One day it will be commonplace. At one point it seemed as if Hadfield was actually channeling Holmes, when talking about social media having to be a social experience. He suggested that you need to really care about what you’re communicating with 140 characters. It’s an opportunity to engage in meaningful thought and the exchange of ideas..